Modern doesn’t have to mean bare and cold! Check out this comfortable modern living room mood board for kid-friendly home decor ideas done on a budget! 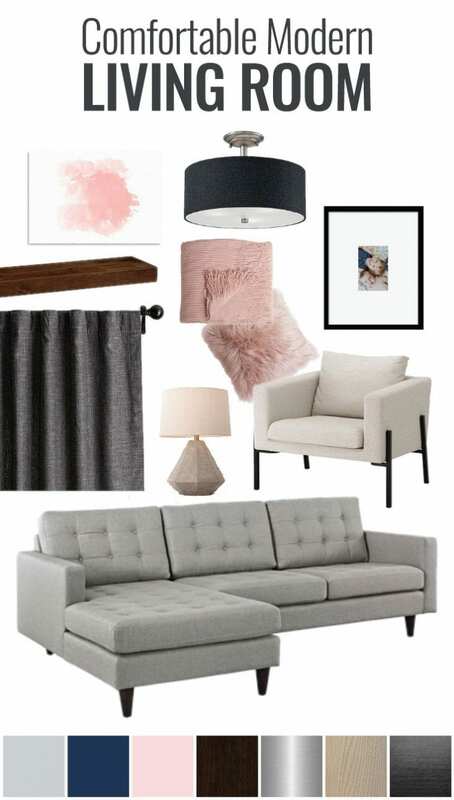 Earlier this week I shared some modern living room inspiration and today I thought I’d share the mood board I put together for our living room makeover. Over the past year we’ve been pondering exactly how to get the look we imagined while still keeping things kid-friendly. As a little refresher, here’s the style definition we came up with after defining our style and combining my husband’s love for modern industrial and my need for a cozy contemporary home. *This post contains some affiliate links for your convenience. For more info, see my disclosure here. Our style is modern with clean lines, open, and airy, but not minimal lacking personality or stark. We like cool contrasting neutral colors, not overly stated, and no bold pops of color. Our style is raw because we like exposed materials and beams with juxtaposed accessories, but not rustic, mismatched or a mix of wood types. Our style is well-balanced, but not overly formal, ornate, vintage, or cluttered. Let’s just say there have been MANY hours spent on Pinterest pinning things that maybe might fit our look and then narrowing things down. I am so excited that we are finally making progress! Modern doesn’t have to mean cold, clean, or minimal. I can’t wait to put together the final room and share it all with you, but until then, here’s a little peek at our comfortable modern living room mood board with sources below. Click the image to be taken to the source. Now, I realize we had said no mixed wood types, however, that more means no random wood types with similar shades, but not quite the same. Does that make sense? Our goal is dark espresso stain and light with a gray undertone shown on the mood board. We like cool neutrals with accents in navy and a few blush pink things to add a little femininity. Since creating this mood board — which is actually version #4 — we’ve found the PERFECT $9.99 curtains at Target, matte black curtain clips, these gorgeous KOARP modern chairs from IKEA, and purchased our new couch!! Oh, and of course, how could I forget we painted our ENTIRE common areas. We have been busy in our home this summer. We have literally set foot in every store that sells couches in about a 15 mile radius of us. Justin and I are NOT big shoppers so at least we made it easy for the salesperson. Us: Hi! It’s close to naptime so here’s what we’re looking for…a tufted back light gray couch with clean lines, open on the bottom, simple legs, chaise lounge on the left (preferably reversible), and 86″ – 115″ wide. Salesperson: Wow. Okay I’ve got “insert number here” for you to look at it. Looked real fast and then left. Blame the kids naps and then they don’t turn on the salesy tactics. In and out and simple. Once we narrowed it down, it was easy to watch for sales and we nabbed our couch Labor Day weekend. Can’t wait for it to arrive sometime in the next month! My hope is that once the couch arrives we’ll be able to put all the finishing touches on the room and check this room off the list. I can’t wait to put it all together and share it with you! So, what do you think? Is this a look you like? I’d love to hear what you think!! I love what you came up with Amanda!!! The navy mixed with the blush is so perfect :) Great job and finding a couch and then scoring one on a Labor Day sale. That’s the best :) Can’t wait to see how this room comes together.